Google Display Network (GDN) consists of a series of websites that partner with them to display ads on their websites and web pages. With the world going Digital, marketers are shifting their advertising edges towards the internet. Google helps advertisers to place their ads on various websites and channels that deem fit and appropriate for the brand. The Google Display Network consists of a series of websites that partner with them to display ads on their websites and web pages. Since target audience for marketers spends a lot of time on the internet, it is important to target the relevant target audience. This is an important way to reach out to a broader set of people. SEO targets users who are actively looking and want to purchase the product. The targeting is more funnelled and very specific. GDN involves content consumption that the target audience is interested in. However, it isn’t targeted to people who are looking for the product but show ads on content areas that make them purchase a particular product. With this type of targeting, ads are shown to users on sites are directly related to the keywords and information is distributed to users by the type of content. Your ads with this type of targeting will be connected to the users once they are engaged in relevant content areas. With this kind of targeting, you can look out for users who are very much interested in what you want to sell. You can proceed with keyword level and use a bidding system to find your customers. You can customise it the way you want to by remarketing, controlling systems, frequency control and capping. As the name suggests, it places your ads on websites and web pages. It also shows your ads on videos, mobile sites, and RSS feeds. 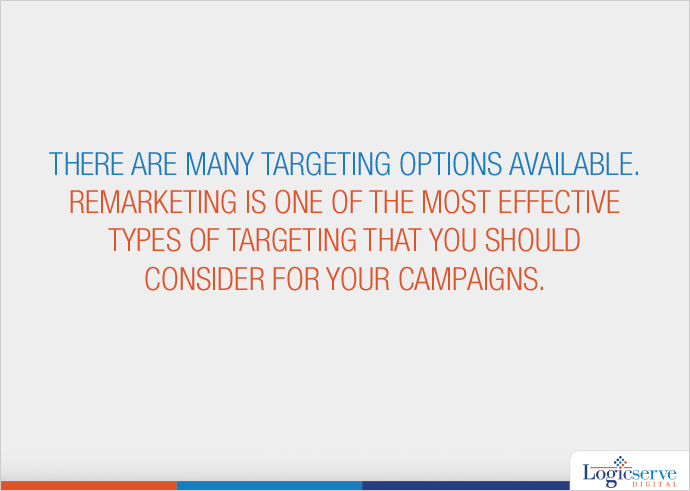 With this kind of targeting, you can choose a particular page that caters to the content related to your brand. For example, if you sell sarees then your ad will be shown on a page that shows content about tips to wear a saree. With this type of targeting, you can show your ad to people/users who have already seen or visited your website on GDN. As the name suggests, it targets websites that the user is interested in. For example, if the user of your brand is interested in pop music then your ad will be shown on websites that have content about pop culture. This type of targeting is similar to interest targeting, but it concentrates on websites than users. If your brand is a sportswear, then the ad will be shown on sports websites or topics related to sports. You can do holistic targeting with this rather than individual targeting. You can target users by their locations and the language they speak. You can target users on the basis of their age and gender. LogicSpeak : There are many targeting options available. Remarketing is one of the most effective types of targeting that you should consider for your campaigns.